The bowl season was still in full swing yesterday even though Penn Manor students had to attend school. Most eyes were on the television but Penn Manor students eyes were on their teachers while Penn State took the field against Houston. 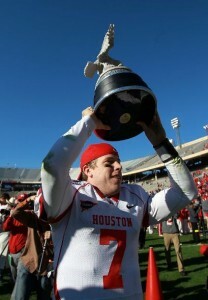 Case Keenum hoists the trophy after the TicketCity Bowl against Penn State Monday. Courtesy of ESPN. The Lions saw their roller-coaster season come to an end Monday without legendary sideline figure Joe Paterno and their starting quarterback, Matt McGloin. But the quarterback on the other side of the ball put on an aerial show in Dallas. Case Keenum led the 20th ranked Cougars to a 30-14 win over the dismal Penn State defense. Keenum passed for 532 yards and 3 touchdowns against the 24th ranked Nittany Lions. Case Keenum showed off his arm early putting the Cougars up 7 just 1:52 into the game when he hit a streaking Patrick Edwards for a 40 yard touchdown. Then near the end of the first quarter, Keenum threw an 8 yard touchdown pass to Justin Johnson. Running back Stephfon Green scored off a six yard rush for the Lions with about six minutes remaining in the third quarter. But the Cougars held a 24-7 lead heading into the half after Keenum scrambled and hit a streaking Edwards across the middle for a 75 yard score. The Cougars quarterback made the normally stout Penn State “D” look silly with some of the throws he made. Keenum ended the game 45 of 69 passing with 523 yards and three passing touchdowns. Keenum’s hot streak came to an end. He was kept under control in the second half by the Lions defense, giving up only two field goals. The Lions cut the lead to 13 when Rob Bolden hit Justin Brown for a 69 yard touchdown near the end of the third quarter, but that was it for them. Bolden also threw three second half interceptions which dug a hole that the lions could not get out of. Penn State surrendered a season high of 600 yards. The game may have been overshadowed by the job search for a new coach. Tom Bradley, a candidate in the search, was named interim head coach after Paterno’s dismissal. This all happened once Happy Valley was rocked by sexual allegations surrounding forming assistant, Jerry Sandusky.